It is with both great sadness and gladness that I report Master Fu Yuan Ni’s passing at 101 years of age – sad that this man who has left such a profound effect upon so many lives has departed this realm and glad that he left on top – mentally lucid to the end and without much pain. Some suggest that he chose when to die as his wife of over 70 years had passed away just 2 months prior. A large family survives him, including 7 children and 3 great grandchildren. Master Ni was born in Shanghai on July 1, 1914 and died March 24, 2016. In 1973 he came to Santa Barbara to teach Tai Chi. He spent the next 40 years teaching Tai Chi, Swords, Push Hands, and Meditation to innumerable students. He was a spiritual master as well, regularly providing us with guidance on the Path. His dedication to his students was awe-inspiring. The number of times he missed a class due to injury, sickness, or even vacation can be counted on the fingers of one hand. 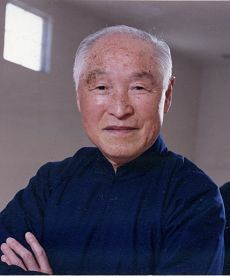 Up until his last class at the age of 88, he performed all the complicated and strenuous movements in an hour and half long class. At the age of 95, he returned to teach a 4 week-long Meditation seminar. A large and growing Tai Chi class based upon his method continues to thrive nearly 13 years after he retired. Every time we practice his forms and meditate his presence lives on in our body, heart and spirit. For any who are interested, we are having a ‘remembering’ of his life on Saturday April 16 at 729 Chiquita Road at 2PM. Call Don at 966-1945 for more information.